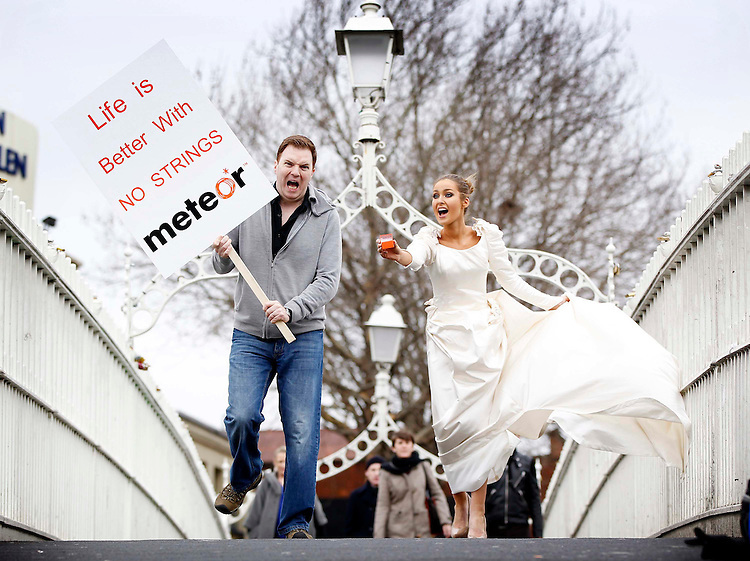 No Repro Fee..Life is better with no strings, thats the resounding message revealed today by a recent survey commissioned by Meteor. The Meteor Commitment Survey lifts the lid on Irelands views when it comes to the dreaded C-word and men throughout Ireland will be intrigued to learn that a fifth of the women who participated in the survey would consider proposing to their man on Leap Day, February 29th..Roz Purcell and Bernard OShea were on hand at the launch of Meteors SIM Only plans which means customers can enjoy the great benefits of being a Meteor customer for 30 days at a time, no strings attached! .For more information on the Meteor SIM Only plans check out www.meteor.ie .Pic: Robbie Reynolds/CPR.